Zimmer Biomet is the largest hip implant manufacturer in the U.S. Although Zimmer’s unique materials have shown strong performance in studies, the company recalled a metal-on-metal hip component in 2008 after receiving large numbers of reports of device failure. Doctors had already implanted the device in 12,000 patients. Zimmer is a medical device company that creates a variety of orthopedic implants. In 2015, the company officially became Zimmer Biomet after buying Biomet for $13.4 billion. The acquisition made the new company the second-largest manufacturer in the orthopedic market. The manufacturer promotes several hip products that use Zimmer Trabecular Metal Hip Technology. The highly porous biomaterial is supposed to simulate the body’s spongy bone to provide a high level of friction that helps the hip joint stabilize after being implanted. It also allows growth into the artificial hip implant. The company’s top hip implant, the Continuum Acetabular System, uses Trabecular Metal Technology, Vivacity-E Highly Crosslinked Polyethylene and Biolox Ceramic Technology to create versatile acetabular cups in a range of sizes and options. Some Zimmer hip replacements use the company’s Kinectiv Modular-Neck Technology, which has four parts instead of three. The technology allows surgeons to choose unique sizes and shapes to match the patient’s needs. The company controlled an estimated 31 percent of the market in 2016, more than any other company. Zimmer Biomet also reported more than $1.8 billion in revenue from hip implants in 2016. The company’s annual report that year said that the introduction of three enhancements to its current systems “expanded the versatility” of existing brands, which contributed to revenue growth. These included Zimmer Biomet’s Eco Bi-Metric Microplasty Stem, G7 Dual Mobility Construct and Arcos One-Piece Revision System, which the company credited with driving revenue growth in its hip replacement category. The G7 Dual Mobility Construct is designed to resist dislocation. Next to infection, joint dislocation is the most common complication with hip replacement. To prevent dislocation, surgeons sometimes have to restrain the femoral head that fits into the cup of the implant. This can limit the range of motion for the patient. Zimmer Biomet claims its G7 Dual Mobility Construct will resist dislocation without having to restrain the femoral head. In a standard hip implant, a bearing fits inside the cup and the femoral head moves against this bearing. The femoral head can only rotate so far before its stem hits the edge of the bearing. If it goes farther, the leverage of the stem against the bearing and cup can cause the head to dislocate. In a dual mobility implant, once the ball rotates so that the stem touches the bearing, the bearing continues to rotate, effectively serving as an extension of the femoral head. This allows for extended range of motion without the risk of dislocation. Built on the Arcos Modular Hip System introduced in 2010, the One-Piece Femoral Revision System received FDA approval in October 2015, and was first distributed a little over a month later. The One-Piece Femoral Revision System sizes are designed for small femur sizes, which suggests they are an option for women patients. The original system offered surgeons a variety of interchangeable hip replacement components, which could be implanted using a single set of instruments. The One-Piece Femoral Revision System was built on that model. 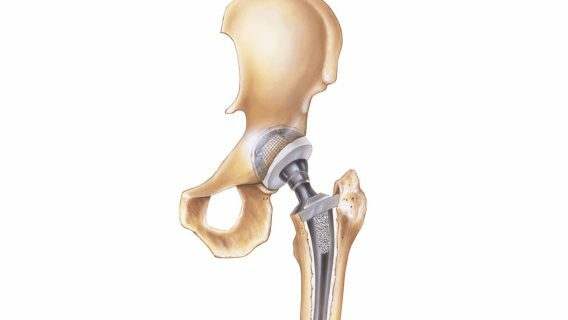 It provides three forged titanium femoral stem options that can be adapted to a patient’s individual anatomy. The size options are designed to address small femur sizes in “patients of small stature,” a term the industry often uses to suggest they are an option for women patients. Though the name suggests the system is designed for revision surgery only, the devices can also be used in primary implant surgery. Part of Zimmer Biomet’s Echo Hip System, this stem is designed for minimally invasive surgical procedures. The Echo Bi-Metric Microplasty Stem attaches through a canal drilled lengthwise, downward through the top of the femur. The stem is short – about 30 percent shorter than the full length Echo Bi-Metric stem – for minimally invasive surgery. Zimmer Biomet says this also preserves more of the patient’s bone during implant surgery. The stem is coated with Zimmer Biomet’s PPS coating, which the company has produced for more than 25 years. The company bills PPS as promoting “long-term bone fixation” to the device. The stem’s design incorporates angles and offsets to allow a surgeon to make adjustments during implant procedures so that the implant does not lengthen the leg. The design is also billed as balancing the demands of patient fit with bearing the load of the patient. The three new hip products rolled out in 2016 are actually modifications and advancements meant to enhance existing product lines. Many of Zimmer Biomet’s hip implant models have been on the market for years, with the company modifying them from time to time with new ideas or innovations. Zimmer’s Continuum Acetabular System is one of the company’s leading hip replacement lines and is an example of changes over time. The acetabulum, from which the device gets its name, is the technical word for the hip socket. The top of the thigh bone – also referred to as the head of the thigh bone, which is shaped like a ball – fits into the acetabulum. This ball-and-socket meeting creates the hip joint. The Continuum System was introduced in 2009 and became Zimmer’s bestselling hip implant within two years. Today, it incorporates the company’s proprietary Trabecular Metal Technology – a porous alloy designed to promote bone growing into the implant to better anchor it in place – and a proprietary polyethylene used in the bearing the company claims is “highly resistant to wear and aging.” The metal has been used in implants for more than 20 years, and the polyethylene for more than 15 years. Among one of the design changes to the Continuum system over the years was the incorporation of what the company called Metasul Metal-on-Metal (MoM) Articulation. This involved making both the ball and socket of the implant out of metal parts. Several implant manufacturers marketed MoM implants in the early 2000s, but abandoned them after serious mechanical and health problems were reported. The current Continuum Acetabular System no longer features MoM components. Zimmer no longer promotes products that use Metasul Metal-on-Metal articulation. Those hip joints were made from forged metal, instead of the cast metal used by traditional hip implants. The forged metal was supposed to be harder, smoother and more durable. But it was recalled when it was linked to complications when used with a Zimmer product that was nicknamed the Durom Cup. The Durom Acetabular Component, commonly known as the Durom Cup, was Zimmer’s most problematic hip implant. The synthetic replacement for a natural acetabulum was made from a single piece of cobalt chromium alloy metal. The Durom Cup was designed to address two problems with other artificial hip devices: durability and range of motion. Longer-lasting synthetic devices were needed to serve a younger patient demographic. Those younger patients often planned to live active lives, and they needed implants that provided superior range of motion compared to the ones traditionally given to older adults. Zimmer believed the Durom Cup solved both problems. It was intended for use with the Zimmer Metasul Metal-on-Metal Tribological Solution LDH, providing a total metal hip replacement that was durable and had large diameter heads for maximum range of motion. The FDA approved the Durom Cup for use in total hip replacements in 2006, and nearly 13,000 patients received the device. Problems began to surface within one year, and Zimmer briefly recalled the hip implant until it could teach surgeons how to implant it. After updating the Zimmer product labeling and creating a surgical training program on its website, the company returned the Durom Cup to the U.S. market despite its problems. More than 1,700 people filed lawsuits against Zimmer, claiming the manufacturer marketed a dangerous product and failed to warn patients of the risks associated with the device. Zimmer discontinued the Durom Cup in 2010, and the company has agreed to settle the majority of cases filed against it. However, the settlement process has not been finalized.